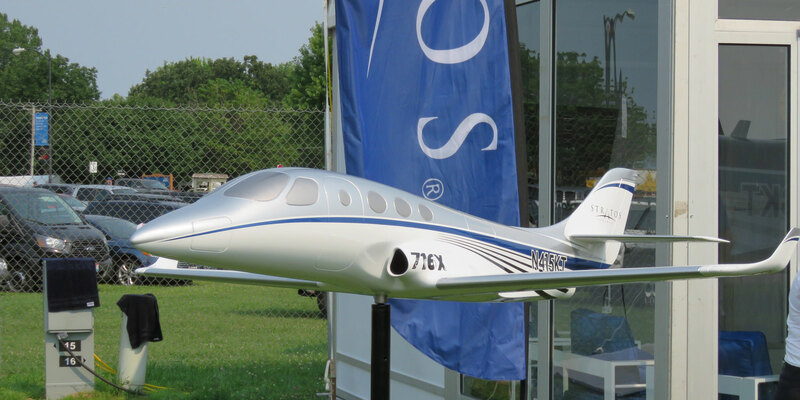 ﻿Stratos Aircraft will make a new, larger version of its Model 714 single-engine personal jet proof-of-concept (POC) aircraft available as a builder-assisted kit beginning in the fourth quarter, the company announced on Monday at EAA AirVenture. The new Model 716X features seating for six and is larger and wider than the 714, with a fuselage that is 31 inches longer and two inches wider than that of the 714. It will be powered by a 3,000-pound-thrust Pratt & Whitney Canada JT15D-5 turbofan and feature an electronic engine control. The 716X’s instrument panel will feature a variety of Garmin products, including dual G3X EFIS, GTN 750 GPS/com, and integrated autopilot. In addition, the jet will have air conditioning, a fully automated pressurization system, custom switch panels, and several Mid-Continent products, including a Standby Attitude Module with backup battery and a pressurization monitor. The 714 proof of concept aircraft has flown 185 flight hours, achieved an altitude of 25,000 feet, and a maximum true airspeed of 370 knots, said Sundin. Over the last year, the company has flown the aircraft pressurized and concentrated on refining its flight test data acquisition system and drag cleanup, including the installation of fairings on the flap hinges. Sundin said that because the 716X is slightly larger than the 714 it would likely be slightly slower than the 714’s projected 415 knots. Stratos expects to have price and performance data for the 716X available later this year.